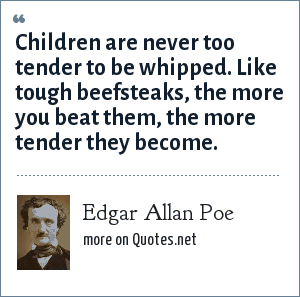 Edgar Allan Poe: Children are never too tender to be whipped. Like tough beefsteaks, the more you beat them, the more tender they become. Children are never too tender to be whipped. Like tough beefsteaks, the more you beat them, the more tender they become. "Edgar Allan Poe Quotes." Quotes.net. STANDS4 LLC, 2019. Web. 18 Apr. 2019. <https://www.quotes.net/quote/35325>.